Take a look at these all around best models to help find the washing machine that will suit your family's needs. From high capacity interiors to smart technologies that will make doing the laundry easier than ever before, these washing machines deliver. The LG Smart ThinQ WT6001HV is given one of the highest scores on Top 10 Reviews for its green cleaning and space-age technology. The machine has 14 different cycles including one that sanitizes, and offers remote error alerts so you don't need to enter the laundry room just to find out there's a problem. The best feature is the way the machine will sync with your smartphone, allowing you to check your energy usage, water consumption and cycle progress. You can even turn it on and off remotely if you forget before you leave the house. 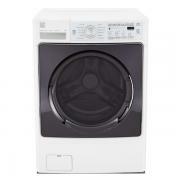 The Samsung WF405ATPAWR/AA is a front loading steam washer that holds up to 4 cubic feet of laundry and features the company's exclusive Power Foam technology. The foam easily gets into fabrics for a deep clean. It's an efficient, quiet washing machine with little vibration. The machine is Energy Star rated and its "steam spray" feature speeds up the cycle, resulting in the use of less energy and water. Best Buy customers give this model a 5-star rating and point out that it's great for removing stains, saving water, and running quietly. Reviewed.com Laundry gave the Kenmore Elite 41472 a perfect score of 10, declaring it better than 99 percent of all other washing machines. The 4.0 cubic foot machine gets clothes clean in just 38 minutes from start to finish. The machine does a great job of getting stains out of clothes and has a steam cycle for sanitizing. The controls are simple, intuitive and easy to use, and it's energy efficient as well. 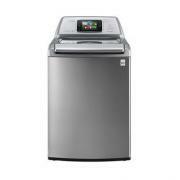 The GE GFWH1200DWW front-loading washer is a smaller capacity machine, holding 3.6 cubic feet. It is Energy Star qualified and ADA compliant, offering a number of cost and energy saving features. The eWash cold water technology lets you cut back on hot water use, while the Speed Cycle setting completes a wash cycle in about 36 minutes. The fast spin speed at the end of the cycle removes more water from your clothing so that they need less time in the dryer. 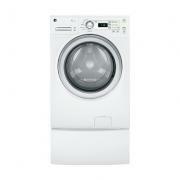 Reviewers at US Appliance love the low vibration and the fact that it uses less water than other washing machines.